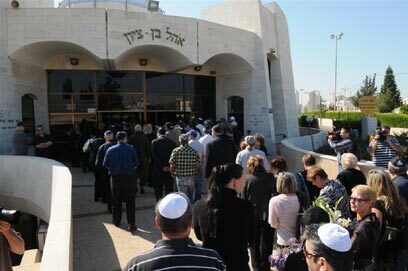 Ex-spy Shabtai Kalmanovich, was murdered Monday in Moscow was laid to rest Thursday at a Petah Tikva cemetery. Dozens of mourners attended the funeral. "I want you to know that I am proud and always will be proud of being your daughter. You did not put me to shame. You were a spirited Jew and an ardent Zionist," said his daughter, Liat, in her eulogy. Kalmanovich's business partner, Yossi Priel, said at the gravesite: "People who read the newspaper know only a small part of Shabtai's life. We are saying goodbye today to Shabtai, who didn't deserve to be killed like this, in sorrow. He was a warm person, good-hearted, helped a lot of people. It is symbolic that he is being buried in Israel." Kalmanovich's former lawyer, Attorney Amnon Zichroni, who represented him in his business affairs in a number of countries, summed up the businessman's life as a colorful one. "His death is shrouded in mystery. I do not think that he had a connection with crime in Moscow, but you can never know what goes on there." Zichroni said that he was in touch with Kalmanovich just a few weeks before his murder. "I presume he was afraid for his life. A person who walks around with body guards and armored cars doesn't do this for no reason." Zichroni defended Kalmanovich's image: "The Israeli public knew him on the backdrop of the criminal case against him that accused him of spying. But he wasn't accused of serious spying and did not damage the security of the country. We are accustomed to the image of the classic spy who passes on military secrets. A distinction must be made between the different kinds of spies. He wasn't the kind who passed on military secrets." Yisrael Gudovich, architect and former Tel Aviv chief city engineer, attended the funeral and had good things to say about Kalmanovich: "Nothing was proven against him. He was released from prison under a plea bargain." Kalmanovich was shot dead with an automatic weapon while riding in his black Mercedes in Moscow. His driver was wounded in the drive-by shooting and was hospitalized in serious condition. Kalmanovich was born in Lithuania in 1947 and moved to Israel with his Zionist family in 1971. According to foreign reports, Kalmanovich agreed to join the KGB as a sleeper agent in exchange for an immigration permit. According to the indictment against him, Kalmanovich was handing over information to the Russian intelligence service for 17 years. He spent five years in an Israeli prison before his release, due to medical problems. In recent years he sponsored an Israeli female basketball team and also returned to Russia to promote his business career. See all talkbacks "Ex-spy's daughter at funeral: I'm not ashamed of you"